1. Place the chocolate in a heatproof bowl and set over a pan of barely simmering water, stirring until melted. Set aside to cool to room temperature. 2. In a separate bowl, mix the mascarpone with the caster sugar then add the chocolate, stirring all the time until smooth and completely combined. Lastly, stir through the orange zest. Pour the mixture into the pastry case and smooth the top. Chill for 15 minutes or until ready to serve. 3. 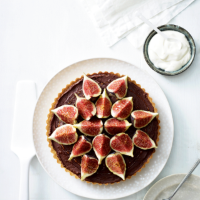 Just before serving, cut the figs into quarters and arrange on top, finishing with a drizzle of honey.